So, what do I tell my Jewish friends and relatives if they ask how I feel about the situation between Israel and the Palestinians? I can say I’m still a “nice Jewish boy” for one thing. I can even say that I’ve always thought the Jews who were the victims of the Holocaust had every right to kill their captors if they had the opportunity. And, finally, I could also condemn Hamas for continuing to fire rockets into Israel at the obvious cost of the lives of Palestinians. In that sense Hamas is very little different from the Likud government even though their fire power is miniscule compared to that of the IDF. In fact, Hamas, one could argue, is Israel’s partner since the rockets don’t provide any defense at all against Israeli policies. No five year old Palestinian child who has just lost his parents, his legs, and his home can feel a sense of pride in the Hamas offensive. There is NO defensive strategy in the effects of the rockets. They only support the ethnic pride of Hamas soldiers and leaders. 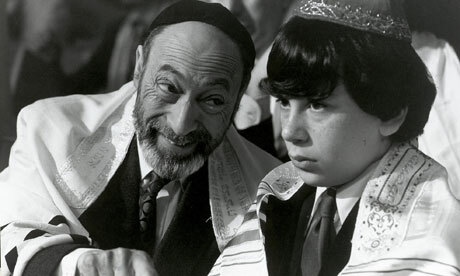 So, if I had my Bar Mitzvah speech to do over again right now—I did get to say a few words of my own after reading the Hebrew prayers—I could really be a “nice Jewish boy.” Having a Bar Mitzvah means that the boy has become a “man.” Often at the end of the ceremony the Bar Mitzvah boy announces to the congregation in the temple, “today I am a man.” I didn’t know then what that pronouncement actually meant. But today I can say most sincerely that I really am “man,” a “mensch,” if a mensch means you are not only aware of what’s going on in the world but you also have a very fine moral compass. I am aware, and that awareness makes me revolt against the IDF as well as Hamas, and most especially their respective leaders, for the crimes they inflict on innocents. Any respectable mensch must revolt against this massacre of innocents. Richard Sahn is a professor of sociology and a Contrary Perspective regular. Michael.. I don’t think that changing the semantics ( not semites) vis a vis Israel will change anything in the Middle East. Lets face it, every goddamned Middle Eastern “nation” is as arbitrary as Israel. Iraq, Saudi Arabia, Palestine, Lebanon, Syria, Jordan, et al are phony “nations” set up following WW I ( the Sykes-Picot treaty) by France and England for their convenience. You and I don’t like Israeli policies now. I don’t like them because of their effect on US foreign policy. I cringe at the blind asymmetry of their assault on the Palestinians and wonder how in hell they think that kind of policy can accomplish anything but more bitter opposition in the long run. It might make one feel good to call Israel names but it is a national reality now and as legitimate or illegitimate as Saudi Arabia, with its 16th century kingdom or Syria with its dictator. Is Maliki, the current Shia dictator of Iraq treating his fellow Muslim Sunnis better than the Israels are treating the Palestinians. NO! He is dropping ‘barrel bombs’ loaded with shrapnel in Sunni villages all over Anbar province. What’s the semantic description of that? Isn’t that a “nakba”? And who continues to support Maliki? Why, of course the same US outfit that supports Israel. I am an Aristotelian and always look for first causes. The first cause is right here at home. Calling Israel names will change nothing here. Those few of us who care must focus our efforts at explaining to all who will listen that as long as we are addicted to oil and let corporate business interests control our domestic and foreign policy on the false assumption that fossil fuels will always be available we will be pursuing Muslem terrorists, kissing Saudi king’s asses, and supporting destructive Israeli policies. And while we are at it who gave us the right to kill and kick the native Americans out of their Land? What would you call us? Wait.. Don’t tell me. So, contrary to what some disparage as “just semantics” — by which one has to assume they mean: “who cares what words mean?” — I maintain with the Master, not to mention Alfred Korzybski, that what we mean by words has everything to do with how we and others act in accordance with them. And like George Orwell advised us in his classic essay Politics and the English Language we should choose our words and not let the words of others choose us. So I try as well as I can to “rectify the names” and choose the words I use based upon what I want to say, not what others wish to hear. I have no intention of passively accepting and repeating the words that others have carefully constructed to imply my agreement with their loaded insinuations, whether racist or religious or political or military or economic, etc. So as concerns the Nakba, or disaster in Palestine, I have carefully explained the words I use and my reasons for using them. I consider them truthful and appropriate and do not apologize for them. If apologists for Apartheid Zionism or Saudi Wahabism or American Exceptionalism — have a problem with my unwillingness to parrot their choice of words and the implications contained in them, then that constitutes a problem for them and not me. As Alfred Korzybski wrote in Science and Sanity (1933): “I say what I say. I do not say what I do not say.” So I do not use the biblical/mythological “I-word” misnomer and instead choose to say “A.Z.E.” or “Tenth Crusade.” I have no control over whether or not anyone else chooses to use these descriptive and appropriate terms. But the rectification of names has to start somewhere, and I’ll certainly do whatever I can to move the starting point of discussion closer to the truth of things. I’d like to move on to George Orwell’s essay “Through a Glass, Rosily,” in which he rejects the division of the world into binary opposites so that criticism of A automatically implies agreeing with B. As applied to this conversation, my criticism of the Apartheid Zionist Entity does not mean that I condone or excuse Saudi Wahabism or American Exceptionalism or Vietnamese Communism or Japanese Re-Militarization, or anything else. I criticize what I think deserves criticism. I applaud what I find admirable. And I couch my criticism or admiration in language of my own choosing. Others can, of course, do the same. Some pretty hard words, but the author says up front what he means by them, and so — agree or disagree with his views — one can at least understand what he means. On the other hand, those who fall back on the uncritical use of received terminology carefully crafted by self-interested parties to obfuscate more than clarify, mostly serve as unwitting accomplices to their own deception. Michael.. Just to cut the the core, let me say again that in my view what happens in my country trumps all other considerations. We are citizens of the USA. Our responsibility as citizens is to try to make our country better and at this time my arguments have been aimed at terminating our interventions in the Middle East and the Asian sub continent. All of which interventions have failed miserably and are causing more danger to the world. That, in my opinion, will help our country. I am surprised that you attacked a straw man when you turned your back on my basic argument that the entire Middle East (including Israel ) is a contrivance of the West and the US. Israel does what it does because we back it. Maliki does what he does because we back him. So forget Aristotle, if one plus one still equals two it is simple to see that if things are to change, we must change since it is clear that both situations have the same origination, American foreign policy. When we are no longer able to change a situation we are challenged to change ourselves. To rant and rail about Israel or Iraq, or Afghanistan is OK if you stay focused on the real problem which lies here. You and I have no ability to change Israel or Iraq, so to waste our breath moaning about them and not zeroing in on the real initiator of the problem is not fruitful. It is constructive to show how the US government has allowed Israeli and Saudi policies to overly influence our policies. It is a waste of time to blow off about Israeli policies without acknowledging our strategic interest in keeping the status quo. “On every occasion, the presentation of events by Israeli spokesmen is geared to giving Americans and Europeans the impression that Israel wants peace with the Palestinians and is prepared to compromise to achieve this, when all the evidence is that it does not. Though it was not intended as such, few more revealing studies have been written about modern Israel in times of war and peace. Dr Frank Luntz and the Apartheid Zionist Entity. What a pathological partnership. Fascinating article. Powerful reminder to focus on works and acts and deeds, not on words. Words are so labile and open to (mis)interpretation. Consider the change from Estate Tax to Death Tax. Same thing, but most people accept estate taxes but oppose death taxes, just on the power of words and their associations. Words, words, words. They can clarify or obfuscate. Here in the belly of the beast words are mostly used to obfuscate really, create fear, and to control/repress the unruly masses. The success of this strategy is demonstrated by the inability of most people to take in the reality that surrounds them. This is as true of liberals as it is of the right. We speak of cognitive dissonance, the inability to confront ones belief system without going off the wall in order not to hear any contradictions to that belief system. Now on to Israel. Israel is a nasty country given its apartheid laws and genocidal behavior and policies. But I agree that as Americans we need to focus on home and a country that has hegemonic goals on the world. What i disagree with is the idea that Israel prompts American policy. Going to root causes, Israel was an American policy and still is. The US supports Israel because of US policies that include the disruption of the Mid-east, having a close ally that is of white European culture at the helm, and has no compunction against using terror and genocide to effect its goals; ie, US goals. The US gives over $3 billion a year in military aid to Israel and Israel, instead of saying thank you demands more. If Israel stopped serving its purpose for American hegemony, it would go almost as quickly as Libya and Iraq. And this is what most people miss and cannot accept.